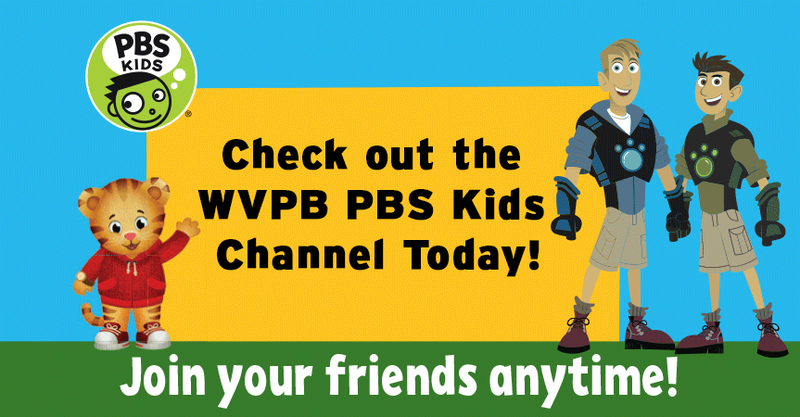 Check out the WVPB PBS KIDS channel and live stream. WVPB's free 24/7 services are designed to meet the needs of today’s kids and provide learning opportunities for every child, especially those at risk, whenever and wherever they access media. Install the PBS Kids Video App on your over-the-top platforms such as Roku, Apple TV, Amazon Fire TV, Android TV, Xbox One and Chromecast. On cable and satellite. If you don't see your provider, contact them and ask them to add the WVPB PBS Kids Channel to their lineup. If your cable provider is not listed, call and ask them to air the free WVPB PBS Kids channel. Q: What shows will be included? Will all PBS KIDS shows be a part of the new WVPB PBS Kids service? A: The WVPB PBS KIDS channel will include popular favorites such as: Daniel Tiger’s Neighborhood, Odd Squad, Wild Kratts and Dinosaur Train; the new series Nature Cat, and Ready Jet Go! ; and Splash and Bubbles, which will premiere November 23, 2016. The full schedule will be available soon! Q: Will content premiere on the new WVPB PBS KIDS channel at the same time it premieres on the primary PBS station? A: The WVPB PBS KIDS services will have a different schedule than our primary channel, offering families a variety of options. Q: Are there going to be new shows? A: As PBS KIDS airs new programming, those shows will also be made available on the WVPB PBS KIDS channel. Q: Are you going to have programs for older kids on the new WVPB PBS KIDS channel? A: PBS KIDS content is designed for children ages 2-8; the same will apply to the new WPPB PBS KIDS channel. Q: Will all of the shows on the new WVPB PBS KIDS channel be available in closed captioned? A: All content will be closed-captioned.